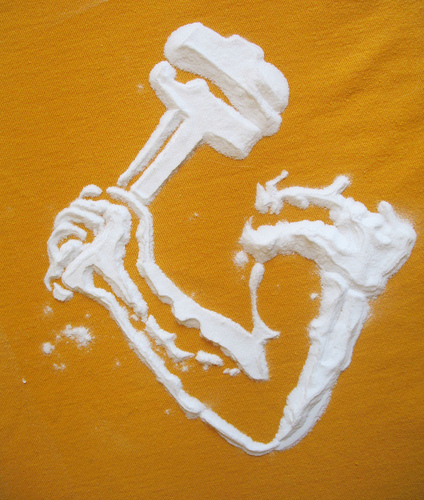 Baking Soda :: The amazing magical powder! Add a teaspoon of baking soda to your usual shampoo bottle to help remove buildup from conditioners, mousses, and sprays, and to improve manageability. Rinse hair with 1/2 teaspoon baking soda in 1 pint water to remove the dullness or discoloration caused by chlorinated pools. Hair spray and oil buildup on combs and brushes can be removed by soaking them in a sink of warm water and adding 3 tablespoons baking soda and 3 tablespoons bleach. Remove fish, onion, or garlic odor from hands with a solution of 3 parts baking soda to 1 part water or liquid soap. Rub mixture in your hands, and rinse off. Rub a baking-soda paste onto your elbows to smooth away rough skin. Soak tired feet in a basin of warm water with 3 tablespoons baking soda. For sunburn pain, saturate a washcloth with a solution of 4 tablespoons baking soda in 1 quart water. Apply to affected area. Baking soda added to the bathwater has a softening effect on the skin. Add 1/2 cup to a full bath. Freshen up with a washcloth dipped in a solution of 4 tablespoons baking soda to 1 quart water. Apply cornstarch to your underarms with a powder puff first, then apply the baking soda. Clean fingernails and toenails by scrubbing them with a nailbrush dipped in baking soda. This also softens cuticles. Mix 3 parts baking soda with 1 part salt. Add 3 teaspoons of glycerin. Add 10 to 20 drops of flavoring (peppermint, wintergreen, anise, or cinnamon) and enough water to make a paste. Spoon into a small, refillable squeeze bottle. To freshen breath, use 1 teaspoon baking soda in 1/2 glass of water, swish the solution through your teeth, and rinse. Soak dentures in a solution of 2 teaspoons baking soda dissolved in warm water. Facial Care - Baking soda can also do wonders for your face. Make a paste of 3 parts baking soda to 1 part water, and use as a gentle, exfoliating facial scrub after washing with soap and water. Rinse your face clean. Men with sensitive skin may find that a solution of 1 tablespoon baking soda in 1 cup water makes a great preshave treatment or a soothing aftershave rinse.